Volkswagen sold a record 10.8 million cars in 2018. Only 100,000 were electrified. The annual sales figures reported by Europe's market leader on Friday underscore the huge challenge faced by global automakers as they pour tens of billions of dollars into electric cars and related technologies. Carmakers around the world regard the demise of the internal combustion engine as only a matter of time, and many have set ambitious targets for sales of electrics and hybrids. Yet they are starting from a very small base. The Volkswagen group, which includes Audi, Porsche and Skoda, sold just 40,000 electric cars last year, or 0.4% of its total deliveries. The figure rises to just 100,000, or 0.9%, when plug-in hybrids are included. Rival German automaker BMW (BMWYY) fared better. It sold nearly 143,000 electrified vehicles in 2018, an increase of 38% from the previous year. Still, that translates to only 6% of the group's total sales. David Bailey, an auto industry expert and professor at Aston Business School in the United Kingdom, said that Volkswagen has fallen behind rivals including Renault (RNSDF) and Nissan (NSANY) when it comes to electrics. "It invested very heavily in diesel, with disastrous consequences," he said, referring to the collapse in diesel sales that followed Volkswagen's emissions scandal. Volkswagen (VLKAF), which competes with Toyota (TM) and the Renault-Nissan-Mitsubishi alliance for the global sales crown, is now playing catchup. It said in November that it would invest €44 billion ($50 billion) by 2023 to develop electric cars, self-driving vehicles and other new technology, a strategy that CEO Herbert Diess described as an "electric offensive." The first model built under its new program, the ID, will begin rolling off the assembly lines in 2022. Diess said the car will have a range of up to 550 km (340 miles) and cost the equivalent of its current diesel Golf. 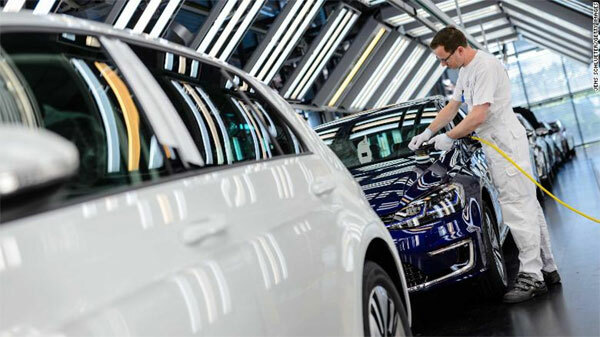 An employee polishes an e-Golf electric inside the Volkswagen factory in Dresden, Germany. Audi is leading the charge for Volkswagen. The brand wants to offer 12 electric vehicles by 2025, and for electrified models to make up a third of global sales that year. The Audi e-tron and the e-tron Sportback will debut later in 2019. Bailey said that established carmakers are all running up against the same problem as they seek to fend off competition from electric upstarts like China's BYD and Tesla (TSLA). They have to keep making money on traditional cars in order to fund their spending on new technologies. Still, more could be done. "They all need to step it up," he said of investment in cleaner vehicles. The race to full electrification is likely to be decided in China, a major destination for investment that is already home to the world's largest market for electric vehicles. Building electric cars in China makes sense because that's where most customers are. It also puts assembly plants closer to the supply chain for batteries, which account for about 40% of the value of electric cars. Volkswagen announced last year it would pump $12 billion into making electric vehicles in the world's number two economy. There's little time to waste. "If European carmakers don't transform quickly enough, they will be wiped out," said Bailey. Ford says it will boost its investment in electric vehicles to $11bn (£8bn) in the next five years, more than doubling a previous commitment.